The post office on Sunday mornings. It was a weekly ritual. I’d wrap my palm around muthacha’s finger and run beside him to keep pace with his mighty strides. Once we reached, he’d hand me a bunch of letters and say gravely, ‘Tutu, these letters are very important. I need you to put them in the postbox carefully. I cannot afford to lose them,’. I was honoured. He’d pick me up and I would drop them into the letterbox one at a time. Slowly, cautiously, almost nervously. No letter in Bangalore was dropped in the postbox better that morning. I’d insist on muthacha carrying me back home. The burden of the herculean task he had just given me, lifted off my shoulders. And the burden of a not-so-light 4 year old on his. Looking back, I never noticed when our Sunday morning adventures stopped. Or how many Sundays its been since the last. Or how a man who would once hand me a bunch of impeccably well written letters now found it hard to sign a cheque. I realise how easy it is to feel betrayed by life when you reflect on the past. When you see that your loved ones are growing older faster than you are growing up. When you realise, that whoever said time heals everything could not have been more wrong. Weekends, public holidays and vacation time. I’d sleepily read The Hindu to muthacha in the morning. It was all very convenient until he started asking me questions. “Tutu, tell me what you understood about the article”, he challenged me one morning. I shamelessly stole a glance of the headline and desperately put together an interpretation of it. We both knew there was no fooling him. He asked me to keep reading. No point widening someone’s horizon when her eyes are snapping shut. 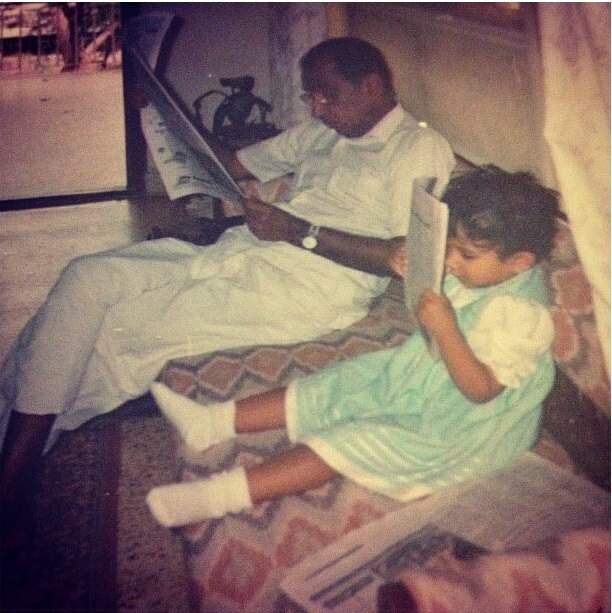 I don’t remember when or how I started reading him the newspaper. I never noticed how thick his glasses were or how one day he stopped using them altogether. How our morning newspaper sessions were more than a just about having to dodge his questions on Indian politics. That it really meant that no lens or magnifying glasses made a difference any more. We marvel at how things change. How we never thought it would happen to us or how we could never have seen it coming. But the truth is, we just don’t notice. We tend to underestimate the depth of our everyday interactions. We forget how the smallest things could add up to make the most defining moments. We simply go about our everyday lives oblivious to the beauty and tragedy of it all. Muthacha waited for the doorbell. And it came. I would respond with my customary frown and head to my room to open my laptop. “That laptop is going to ruin you”, he would say, following me in. “Research, Muthacha” I’d say absentmindedly, minimising my facebook window to ease my conscience. “What research?” he’d demand. “Extra reading for History tomorrow’. He wondered if I was studying. I wondered if he believed me. “Just don’t waste your time, Tutu.” He would say before going to watch the news. I remember this like it was yesterday. Maybe because on most occasions, it actually is. Muthacha has asked me to study every evening for as long as I can remember. Sometimes I realise that nothing is different. That a few things always manage to escape time and its brutality. That it’s the security you get from its understated familiarity that gives you strength to deal with the things that dont. I realise that the most beautiful things happen to us in the subtlest ways. That you would never think of them as the best memories. That you would actually never even think of them. That the memories most precious aren’t the ones that make you feel the best, but the ones that you rely on. The memories that are most precious, are the ones you don’t have to miss. Memories that makes one smile and cringe at the same time. Its time that passes, becomes memories and then forgotten as life passes on by. Really well written. I can feel the emotion as you write. u seem all ‘grown up’ n there is a lot of maturity too, its not teenager stuff…….love you Tuts! Haha Aunty, almost not a teenager anymore! I turn 20 this summer! We haven’t met in way too long! Krsna u r so intuitive. All that u hav written is so true. V take things for granted and only realise the importance of it when its not there any more. Luv u for bringing things into perspective. Beautiful Krsh….I can recall this playing out like a video in front of me….you and your trips to the post office with muthacha! Seems like it was just the other day……!! I loved this post! Muthacha sounds a lot like malayalam for grandpa! Awe! It’s nice finding another malayaleee on here! Nice to meet ya! Hi Krshna…i just chanced upon this one and really loved it…i almost feel like i know your muthacha! I guess simple ordinary things add up pages to life’s scrap book..keep sharing memories!